Check out the Custom Section for special orders. ​Growing up, going to Oswego Speedway with my dad, I started drawing these wild looking cars on any scrap piece of paper I could find. New school year folders always brought out the markers for a new batch of my favorites. Bentley was always on there. :) Welcome to the 21st century...my hobby/craft continues. 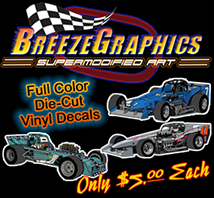 With computer graphic designs, inkjet printers and specialty papers, I am now able to offer these to all the fans as vinyl full color high gloss decals. Show your support for your favorite cars and drivers in a unique way. Waterproof Vinyl Decals a more permanent solution. Waterproof die-cut vinyl decals with High Gloss UV protection makes these perfect to stick just about anywhere. Great resistance to water and sunlight. Permanent adhesive for long duration applications indoors or out. Thank You to everyone who made a purchase during "Jim Shampine Month"
We were able to raise $150 for Families Fighting Flu. I've been searching for years to find a really nice centerpiece to my collection. steer me in the right direction. Any help or info on items like this would be greatly appreciated. Please contact me and let me know what you have.